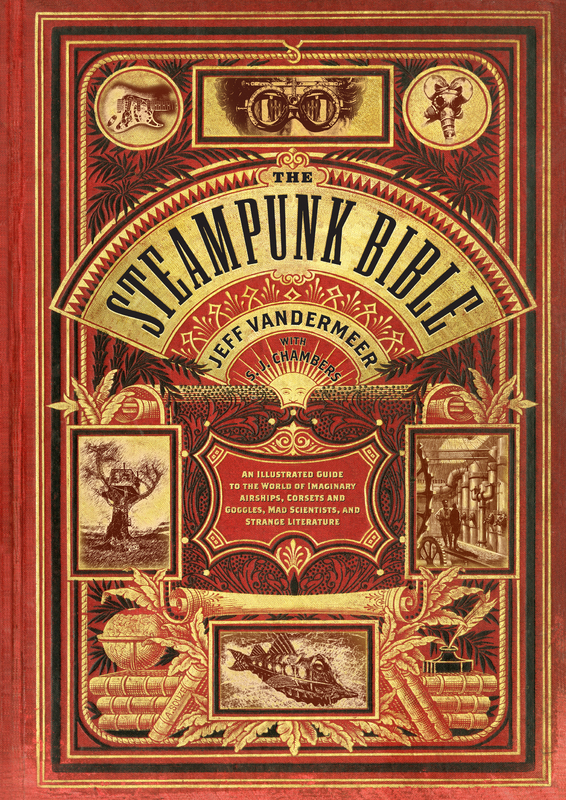 I’m super excited for the publication of The Steampunk Bible by Jeff VanderMeer and S. J. Chambers, available May 1 (pre-order now!). As always happens when I get involved in a new project, I suddenly find myself completely immersed in that world. 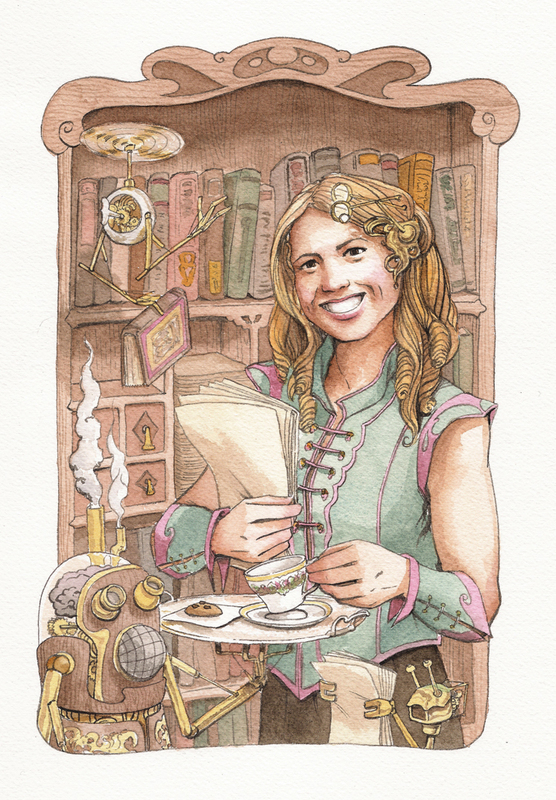 Since working on the book, I’ve been to Steampunk events, I spotted Steampunks at Comic-Con (my favorite was the Steampunk Boba Fett), and I’ve been introduced to some amazing writers and artists who I hope to work with in the future. I feel lucky to have been involved in this project, because I came to this book in a fairly roundabout way. A colleague had acquired it, and only a few months later had to leave the company. Someone needed to step in as editor, and as a lover of science fiction and fantasy, I jumped at the chance. I am so glad I did. Working with Jeff and Selena was a dream. Not only are they amazingly creative, they’re also just fun to work with (very few of my authors respond to my emails with “SQUEEEE.” It’s refreshing.). Jeff also literally knows everyone in the world. I could not believe how many people he conned into being involved with this project. Every day it was like, hey guess what? 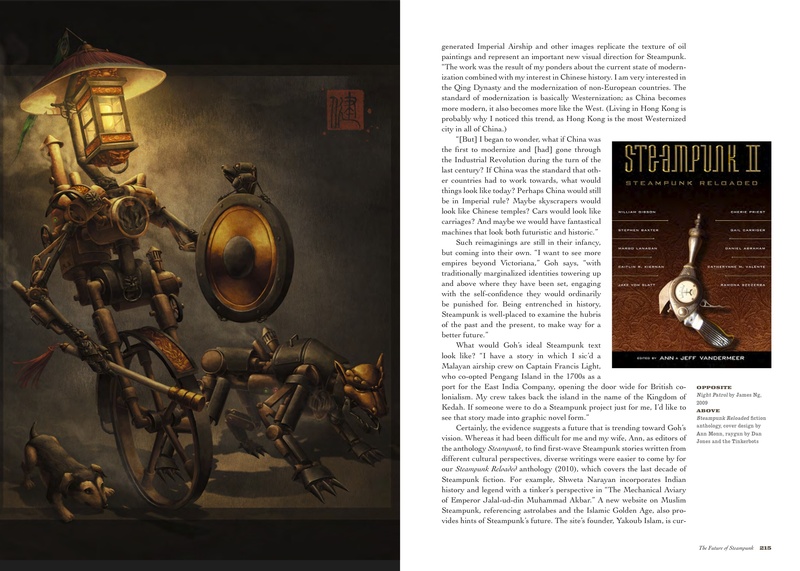 Imperial Chinese Steampunk robots by James Ng? Check! Comic panels from Phil and Kaja Foglio’s Girl Genius, Molly Crabapple’s The Puppet Makers, and Mike Mignola’s Amazing Screw-On Head? Check, check, check! 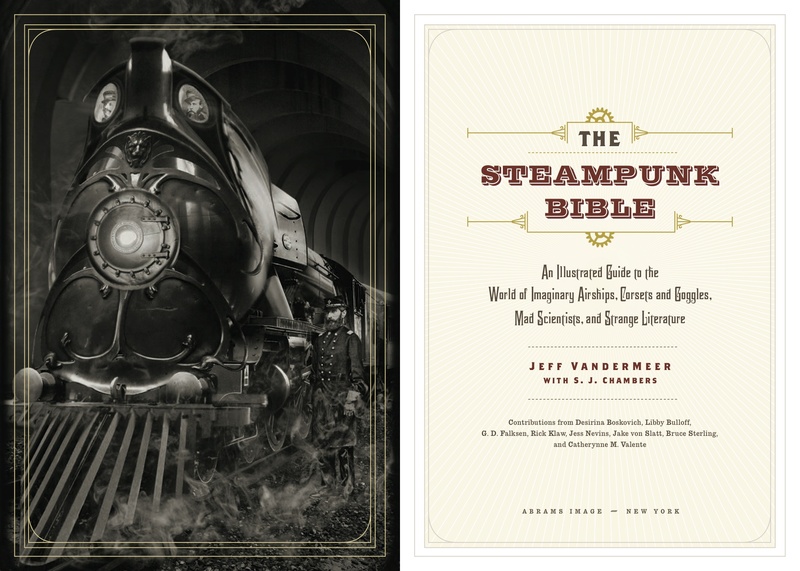 An original project from Steampunk Workshop founder Jake von Slatt? Check! Astounding works of art from Steampunk makers, designers, photographers, fashionistas, and artists from around the globe? In spades! Fitting it all together was definitely the hardest part. Our wonderful designer Galen Smith did a stellar job of figuring out this jigsaw puzzle, and the result is just stunning. As I am an endpaper snob, the dragon dirigible sketch and finished piece is just the perfect opening and closing to the book. The cover riffs on an old French edition of Jules Verne’s Voyages Extraordinaries (currently hidden in my office). When we asked Jeff and Selena for ideas about cover direction, Jeff mentioned the old French editions as a possible starting point. I doubt he expected us to take it as far as we did! 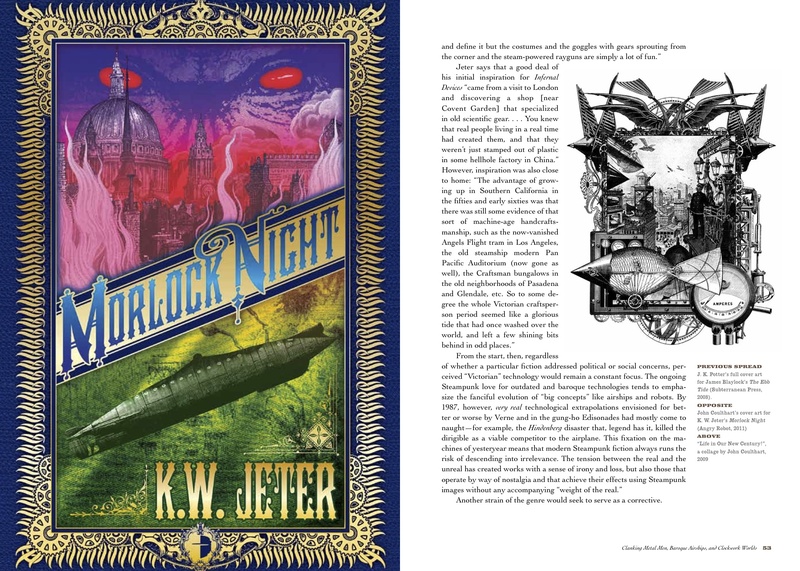 We found a beautifully preserved copy on eBay, scanned the cover, and then digitally altered it to include modern Steampunk images and our own text. The result is set off with a spot gloss that really makes the gold pop against the red. I’m so happy with the finished book and can’t wait to see it in stores. 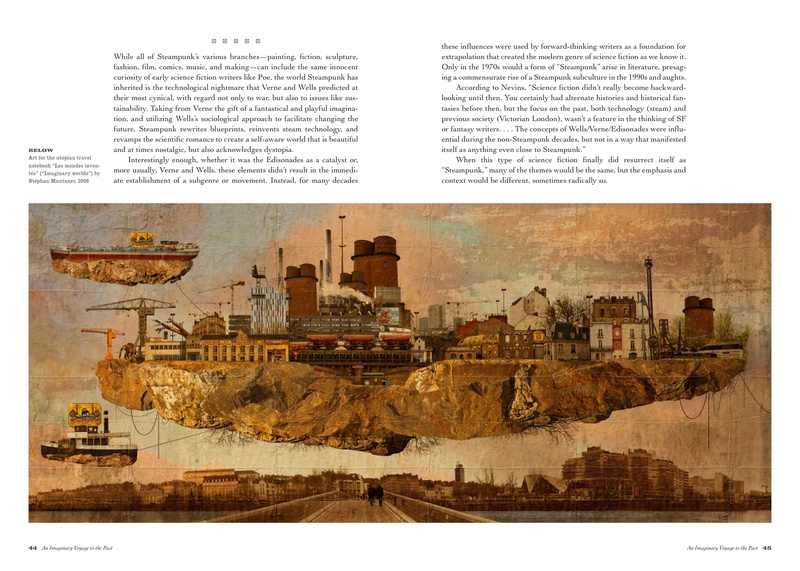 Here are some sneak peek spreads for your perusal and also, the very special debut of my Steampunk portrait. I asked Jeff and Selena to have their portraits done by the very talented Krista Brennan for the About the Authors page and they “forced” me to have one done as well…which I did not include in the book mind you! My colleagues are all very jealous and want robot helpers who delivery tea and biscuits as well. My boyfriend was really excited to get this book because he is actually IN it!! He flipped through the book excitedly only to find he was mis-credited in a photo. The giant picture on page 135-136 labels him as Jesse Nobles, who is the photographer. It should read Captain Anthony LaGrange. The black man in that photo is Captain Anthony LaGrange. We run a local steampunk group here in Columbus, Ohio: The Airship Archon. Just thought people might want to know. It may get corrected on future versions. Thanks for bringing this to my attention! We’ll make sure to get it fixed when we reprint. I’m so glad you’re enjoying it Sue! The amazing James Ng did the endpapers. I just love them!